Many people wonder whether or not bed bug bites are harmful. Do they hurt? Do they leave a rash? What are bed bug bites symptoms? The image below shows you what bed bug bites look like. The truth is that bed bug bites are generally not harmful, but the irritation from them can last for longer periods of time than other common insect bites, such as flea bites. The difference between a flea bite and a bed bug bite is the center. Flea bites create a red dot in the center. Bed bug bites do not. 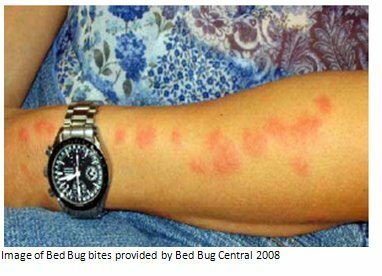 If you discover bed bug bites, it's important to identify that you have bed bugs before you start treatment. We've created a handy how-to treatment guide that walks you through what bed bugs look like, where to look for bed bugs, how to get rid of bed bugs, and how to prevent bed bugs. Visit our Bed Bug FAQ page for other common bed bug questions and facts. 482 of 582 people found this article informative and helpful.